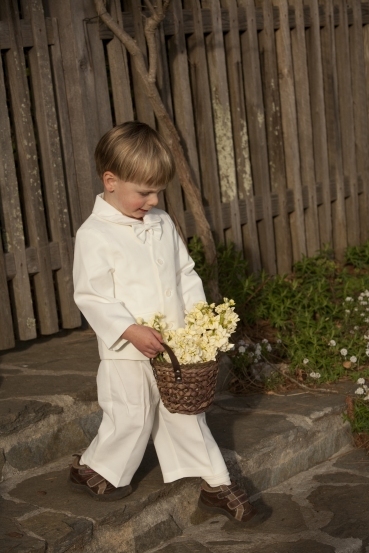 This spring/summer suit is a classic in ivory. It is perfect for Easter and beautiful for formal or beach weddings. The set includes a fully-lined Eton style jacket, elastic waist pants, a cotton poly blend short sleeve shirt with a Peter Pan collar, and a banded bow tie. The outfit runs true to size though the pants length may be a bit short for some children. Please call us if you want more detailed measurements on a specific size.